ReLove says, "This solid wood vintage Stanley Furniture desk has been lovingly brought back to life with a timeless look using General Finishes Milk Paint. 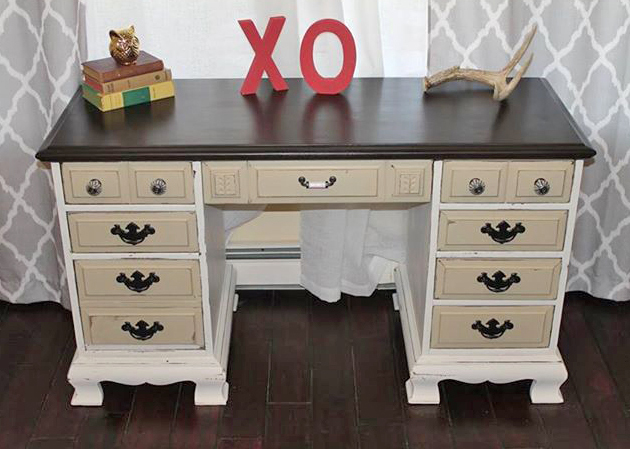 Antique White Milk Paint on the sides and trim and Millstone Milk Paint on the drawers. The top has been finished with GF's Java Gel stain, a rich and deep brown color. The piece features original hardware on bottom drawers painted in oil rubbed bronze and gorgeous Max Studio designer knobs on top. The inside drawers are adorned with original vintage "newspaper" lining.The entire piece has been slightly distressed and then sealed with GF's High Performance Top Coat. A beautiful addition to your home office or any room of the home! Located in Miller Place, NY. Will deliver free within a 10 mile radius and elsewhere for small fee."